It is of utmost importance to inform you that after the screening and scrutiny of your Curriculum Vitae with other verification procedures carried out , Richard Irvin Services Group were able to resolve the status of your application. On this note, we hereby congratulate you on the success of your application and as such we have attached to you the Offer Letter/Terms of Agreement that transcends any written document. We employ staff based on four core values namely: Productivity, Talent, Ambition and Character and we expect all our staff to exhibit these core values. Also we ensure that the welfare of all our staff especially our International Employees are given optimum priority. You are therefore required to follow all procedures immediately so as to complete your employment formalities. You are required to present an Worker's Registration Certificate, which must be procured from the (MWSSI)Ministry of Works and Social Security Inspectorate here in UK , As this is in line with sub-section 12.3 Article1 1.42 of the Richard Irvin Services Group Constitutional policy and code of conduct which you must adhere to , Below is the contact information of the (MWSSI) which you are to contact immediately to obtain an Worker's Registration Certificate. All employees are expected to bear the cost of the procurement of their Worker's Registration Certificate because this will enable the company to provide free visa on confirmation of the Worker's Registration Certificate. Kindly contact the Ministry of Works and Social Security Inspectorate immediately for procurement of your Worker's Registration Certificate. MINISTRY OF WORKS AND SOCIAL SECURITY INSPECTORATE. Croydon, Surrey CR9 2BY Scotland. U.K.
You are required to furnish us copy of your Worker's Registration Certificate on or before 30th day of May 2010. Note that failure to provide the Worker's Registration Certificate (WRC) on or before 30th day of May 2010, could be considered to mean your lack of readiness to resuming with the Company and unwillingness to abide with UK Public/work safety Guideline, and will result to the nullification of the Appointment offer. Richard Irvin Services Group will sponsor your visa, work and resident permit papers to enable you arrive UK on confirmation of the Worker's Registration Certificate from the Ministry of Works and Social Security Inspectorate. We hereby congratulate you on the success of your application amongst many that have applied and thereby instruct you to expedite all requirements as aforementioned so as to be able to meet the team before the deadline. From: MINISTRY OF WORKS AND SOCIAL SECURITY INSPECTORATE. Regarding your mail for issuance of the Workers Registration Certificate, the following are the procedure for issuance of the certificate to enable you live and work here in UK , Great Britain. FOR THE ISSUANCE OF WORKERS REGISTRATION CERTIFICATE for Working in UK ,Great Britain. The Asylum and Immigration Act 1996 requires us to ensure that all employees (Non UK Residence)hold valid documents supporting their identity and their entitlement to work in the UK. By making these checks, we can be sure that we are not breaking the law by employing illegal workers and only employ people who are legally permitted to work in the UK. The following lists of documents have been specified by the Home Office as those which should be provided by potential employees as proof of their eligibility to work in UK,Great Britain. Please note that it is essential that this check is undertaken on or before arrival of the employee in order to ensure that the employer is meeting its legal obligations. These checks are now a routine part of the employment process for (Non UK Residence). Workers from Non Europe countries are required to register to work in the UK using the Worker Registration Certificate. Should an employee fail to do so, then they are in breach of the immigration rules. Additionally, employers who hire non-registered workers are breaking the law and could be subject to a fine of up to £5,000. 3. 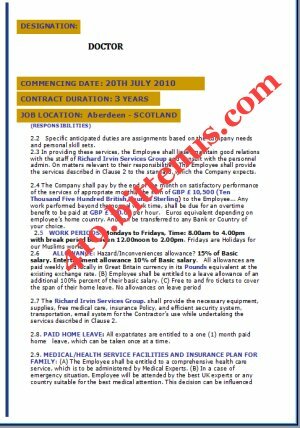 Scan Copy of the Offer Letter (SIGNED BY THE EMPLOYEE) . NOTE: You are required to forward the entire listed documents and Charges as soon as possible. 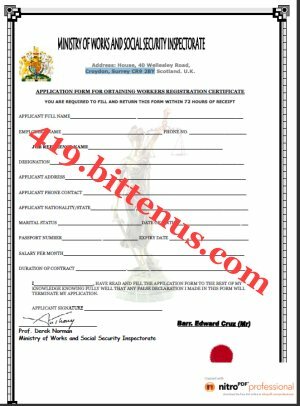 Once we receive the above listed documents along side with the charges we shall be issuing your Workers Registration Certificate to enable you live and work here in UK. Croydon, Surrey CR9 2BY Scotland. U.K..